Now that they've put Einstein's original notes online, it's time to put the original publication chronicling the birth of Spacewar, possibly the first interactive computer graphics game. As it turns out, the Kaleberg Archives include not only the original CACM birth of Unix paper, but the original Spacewar paper as well. This later, as it turns out, was published in the men's magazine Saga. That's right, Saga. You can read the article here. The closest thing we have to magazines like Saga today are things like Maxim, which are much more mainstream and focused on celebrities. In the post-WWII era, magazines like Saga were always a bit less than respectable. They took UFOs seriously, and they ran surprisingly reasonable political commentary. There is a magazine called Saga around today; it's published in the UK and has the tagline Saga - Providing high quality services for people 50 and Over. This is not the kind of magazine that deals with emerging video games. 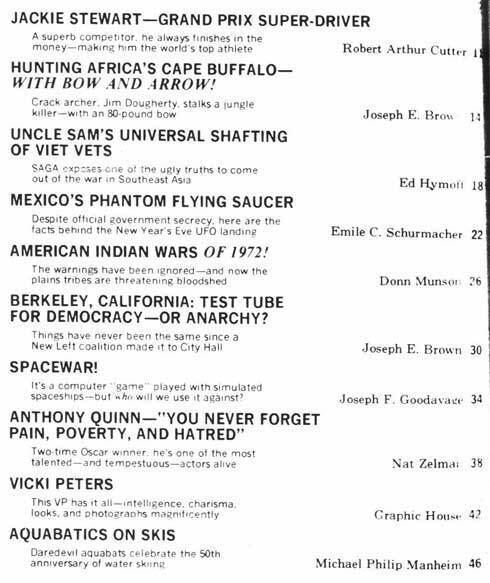 Interestingly, the author of the Spacewar article, Joseph Goodavage, might still be around as well. He's apparently built up a reputation as an astrologer. So, without further ado, set your wayback machine to November 1972, and say hello to a new way to waste your time, welcome Spacewar.